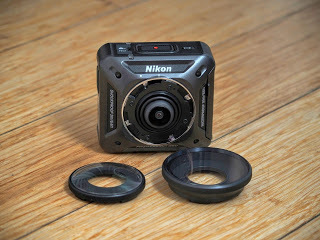 In this post, I will discuss my preliminary review of the Nikon Keymission 360 after having used it for a week, based on my experience with having owned several other 360 cameras, and having shot with 360 cameras almost exclusively for the past 18 months. The Nikon Keymission 360 was announced in January 2016 and generated a lot of excitement because it was the first 360 camera from any of the three largest camera companies. 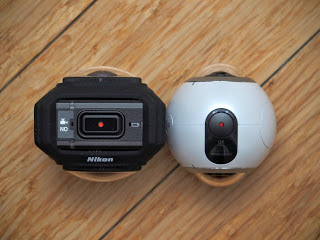 Moreover, Nikon announced that it was both waterproof and shockproof — the first fully spherical 360 camera with these capabilities. 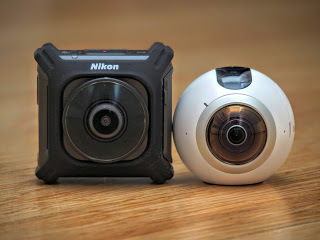 It would also have fully spherical 4k video, at a time when only two other consumer cameras had that capability (the Samsung Gear 360 and the Kodak SP360 4k dual pro), previously found only on professional 360 cameras or camera rigs that cost thousands of dollars. The Keymission 360 was originally scheduled for release in Spring 2016. However, by summer there was still no Keymission. Nikon finally announced that shipment would be delayed to October due to software issues. Meanwhile, there was much speculation about its price and specifications. Nikon indeed launched the Keymission in October at a $499 price, with US shipments starting on October 26. Anyone who preordered by October 22 would also receive a free accessory kit. I ordered one with my own money from B&H Photo (it’s not a review copy, and neither Nikon nor B&H paid me to do a review). The Keymission’s packaging is pretty simple and it’s just a carton box. To be fair, other Nikon products I have had, even full frame DSLRs, also had very simple packaging. 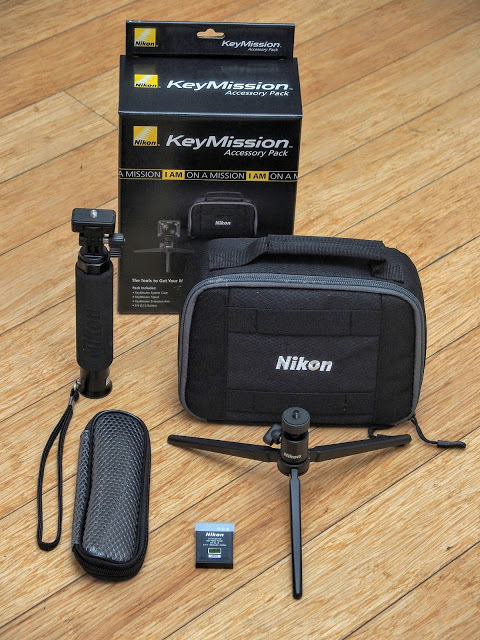 The Keymission’s box has a photo printed on it, unlike the simple gold and black boxes for Nikon’s DSLRs. – standard front elements (they come attached to the Keymission 360). – underwater front elements. The standard front elements can be used underwater, but due to refraction, the image won’t be as clear. In addition, the standard lens goes “only” to 20 meters, while the underwater lens cover can go to 30 meters. On the other hand, the underwater lens covers will have a black band visible along the stitch line. – a black silicone cover, which protects the edges from bumps. There’s a more visible orange silicone cover available as a separate accessory. – a Nikon EN-EL10 battery. This battery is also used in some other Nikon point-and-shoot cameras, which makes it easy to find a replacement battery or charger. – an unassembled Google Cardboard viewer, literally made from cardboard. It does not include a MicroSD card. You need to supply one yourself (up to 128GB capacity). – a zippered bag with compartments. The bag can accommodate all the contents of the accessory pack, plus the Keymission and a few other accessories. – a small zippered pouch that resembles a pencil case. However, I wish the ballhead on the mini-tripod was a little more rigid. Even when fully tightened, it is still possible to move the ballhead. 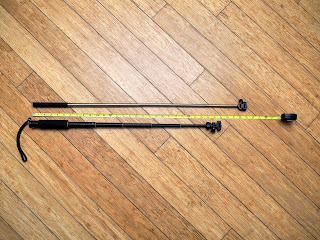 The extension arm is about 29 inches long, slightly shorter than a typical selfie stick, but much more rigid and durable. The bottom of the extension arm has a 1/4-20 tripod socket, allowing it to be mounted with the included mini-tripod. The 6-section extension arm can be extended by twisting a locking nut above the handle counter-clockwise. 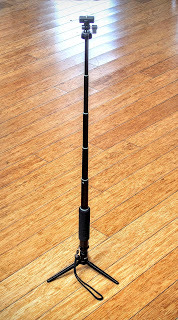 The mini-tripod can be attached to the base of the extension arm. – Shutter speed: 1/8000 to 1 sec. – ISO: 100 to 1600. The Keymission feels very solidly built and is a little heavier than you might expect. It’s approximately the same size as the Samsung Gear 360, although a little bit taller, and its lens doesn’t protrude as much as the Gear 360’s. On the bottom is a metal 1/4-20 tripod socket, which is more sturdy than the plastic socket found in the Theta, for example. 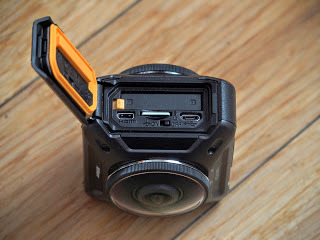 On one side of the camera is a watertight door with a 2-stage unlock, housing the battery, memory card, Micro USB port, HDMI port, and an Airplane Mode switch (to disable Wi-Fi and Bluetooth). The front element of the lens can be removed for replacement or to be exchanged with the included underwater front element. The standard front element can be used underwater up to a depth of 20 meters. However, Nikon warns that it may be blurred due to the underwater refraction. The underwater front element is specifically designed for underwater use, up to a depth of 30 meters. However, there will be a black band along the stitch line. Most of the controls for the Keymission are in the app, which is available for both iOS and Android. To connect with your phone, the Keymission requires both a Bluetooth and Wi-Fi connection. Accordingly, pairing the Keymission takes more steps than on other 360 cameras which use only Bluetooth or Wi-Fi. Here is a detailed step-by-step tutorial. The Keymission is supposed to have NFC as well, but I could not connect successfully via NFC (with a Samsung S6). The Keymission controls are very simple. 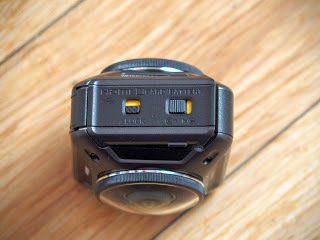 There are only two buttons – a video button on top and a photo shutter button on one side. You turn on the Keymission by pressing either button. Unfortunately, this also has the incidental effect of taking a photo or a video. But you can turn it on without taking a photo or video by holding down the video button for about 4 seconds. Nonetheless, it is very easy to accidentally press the button and inadvertently start recording video. On the other hand, the Keymission is ready to shoot a photo or video immediately at a moment’s notice, with zero startup time. Besides shooting with the camera, you can also shoot with the app. Shooting with the app allows you to get a live preview, which is fully spherical, has very little lag, and has vertical correction. – color mode (normal, vivid, or monochrome). Finally, you can also use the app to change settings such as the self-timer (2 secs. or 10 secs. ), auto shut off time, or the volume of the sound effects. Note: these settings will be retained in the camera even if you close the app. Unfortunately, there are no manual exposure controls, nor can you specify the ISO or shutter speed. Remote activation – The Keymission is only one of two 360 cameras that can be activated remotely from standby (the other is the LG 360 Cam). This capability is useful when you want to record only selected parts of an event. When you launch the app and select a camera function such as remote photography, or downloading photos, or changing settings, the app can wake the camera up from standby and reconnect with the Keymission via Bluetooth. Once the camera is re-activated, you can connect to the camera via Wi-Fi (this is automatic on Android phones, but iPhones will require manually reconnecting via Wi-Fi). Electronic Vibration Reduction – The Keymission can stabilize the video using the data from its gyroscope to offset any vertical, horizontal or rotational movement. It does work within a limited of movement (it cannot correct large movements). Moreover, this mode only works if you use a video resolution of 1920 x 960 @ 30 fps (as opposed to 3840 x 2160 or 3840 x 1920). Super slow-motion – The Keymission can take super slow motion videos at 120fps or 240fps at lower resolutions of 640×480 or 320×240 respectively. Superlapse mode – This is Keymission’s version of hyperlapse, which is a super fast-forwarded video. This mode is limited to 1920 x 960p. Time lapse video – This takes up to 300 photos at specified intervals and combines them into a video. This mode is also limited to 1920 x 960p. Loop recording – The Keymission can record over a buffer with a fixed duration. This can be used for example as a dashcam, and will record only the most recent video over the chosen buffer duration. 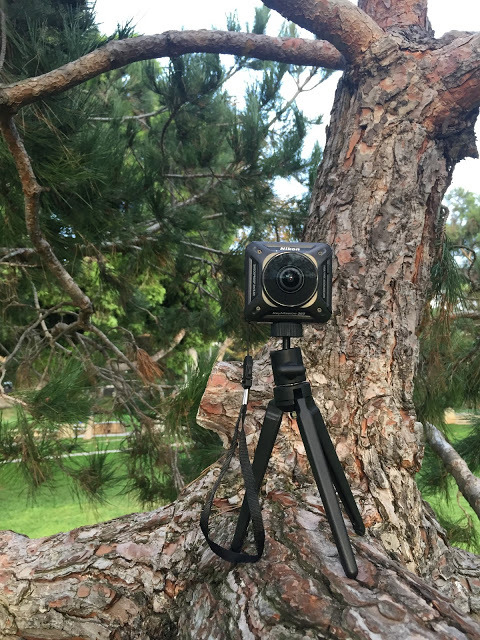 One of the Keymission 360’s strengths is that it stitches photos and videos in-camera in standard JPG and MP4 format. However, the quirky software throws you a few curve balls. The Keymission’s photos don’t have 360 photosphere metadata. This means that some 360 photo sharing sites, such as Facebook, would not recognize the photos as 360. To remedy this, you need to add the 360 metadata using an app such as Exif Fixer (Win or Mac) or Photosphere XMP Tagger (Android). Alternatively, you can upload to a site that does not require 360 metadata such as Kuula.co or Spinnable. By default, Keymission 360 videos are saved with a resolution of 3840 x 2160 after it is paired with the app. That resolution is not the standard 2:1 aspect ratio for equirectangular photos and videos and therefore it tends not to be recognized by standard 360 viewers and editors. Fortunately, you can change the resolution to 3840×1920, which will allow videos to be viewed and edited on standard 360 software. The mobile app and desktop app have simple editing functions for trimming the video. The mobile app can also add a soundtrack. You can share Keymission 360 videos on YouTube straight out of the camera. To share videos on Facebook, you’ll need to add 360 metadata (the app has a function for adding Youtube metadata, which should work on Facebook as well). In terms of optical performance, the Keymission is sharp except near the stitch line. It has minimal chromatic aberration except again near the stitch line. The Keymission is not immune from flare but is not unduly susceptible to them either. The biggest weakness in the Keymission’s image quality is that the stitching is only average — nowhere near as good as that of the Theta (but then again, there’s no camera that can stitch as well as the Theta). I would also say that even though the Samsung Gear 360 has almost identical distance between lenses, the Samsung Gear 360 stitching seems to be a little better. Here is a summary of the Keymission 360’s strengths and weaknesses. 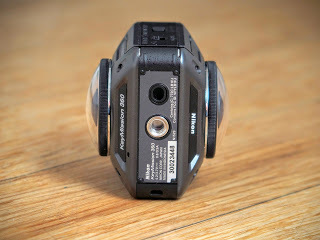 The Nikon Keymission 360 is a well-built camera, and thus far the only fully spherical 360 camera that is a true action camera. 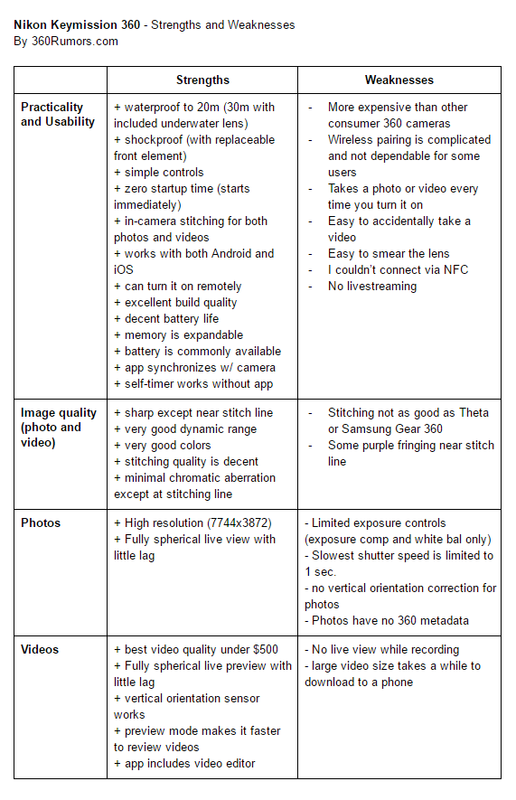 It has excellent video and photo quality, except that its stitching quality is only average. I hope that in the future, Nikon could allow access to the unstitched videos and photos (if possible in raw mode), so that prosumers can use third party software to customize the stitching. While the Keymission’s hardware is excellent, the same cannot be said for its software. Pairing the Keymission with a phone is much harder than on other cameras, and the app lacks many features that users were expecting from a renowned camera company, such as more extensive photo controls and 360 metadata for photos. These software issues can be remedied, and I hope that Nikon will address them. 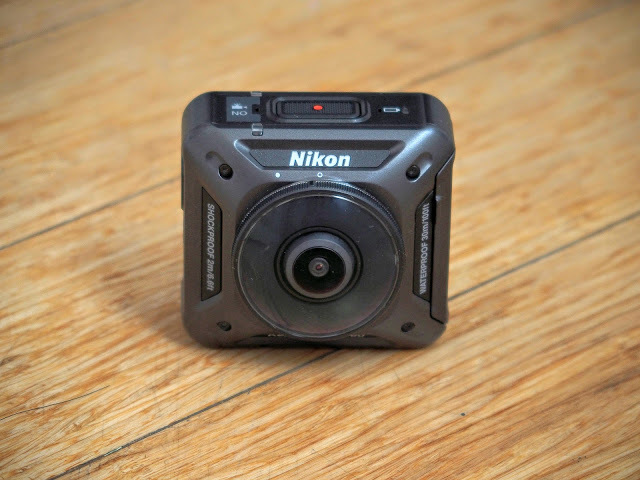 Despite its limitations, the Nikon Keymission 360 is a sensible choice for 360 photographers and videographers who want a waterproof and shockproof 360 camera with very good image quality that they can take to environments that would be impossible for other 360 cameras. 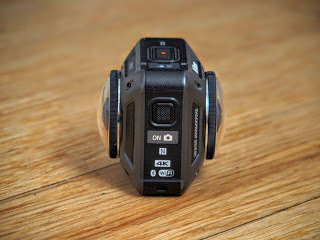 There are also many photographers whose 360 cameras were rendered useless when their lenses got scratched, and they found out there was no way to replace or repair the lens. Those are some of the occasions that underscore the need for a camera like the Keymission 360. If you found this review helpful and would like to purchase the Keymission 360, I hope you would kindly consider purchasing through our Amazon affiliate link or B&H Photo affiliate link, which will go a long way toward supporting 360 Rumors so I can perform more tests and reviews, at no cost to you. Camera should be renamed to KeyZERO the camera that take 0 degree photos of blurry nothing. Its going back to B&H, what an absolute disaster of a "camera". Nikon should be sued for releasing such an untested piece of garbage. I'm sorry you were disappointed with the Keymission. I wonder if it's sample variation (i.e. maybe you got a lemon). Looking at the samples I posted, do you find them problematic in terms of sharpness, color, contrast, noise, or any other characteristic in comparison to the cameras I compared it with, or any other 360 cameras of similar cost (please change the settings to 4k)? Thanks in advance. 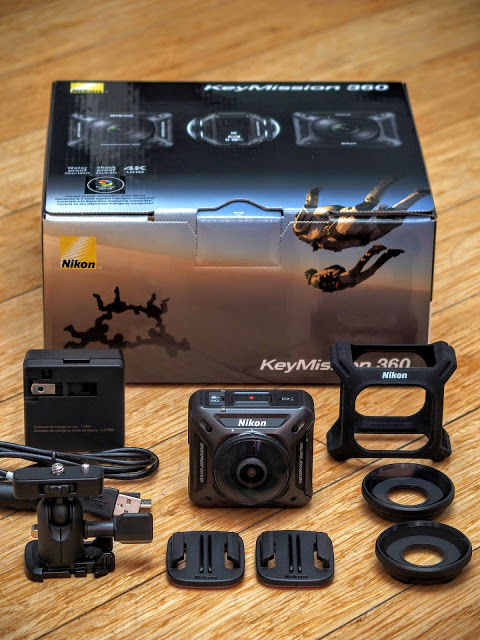 Thanks for the thorough review of the Keymission 360. 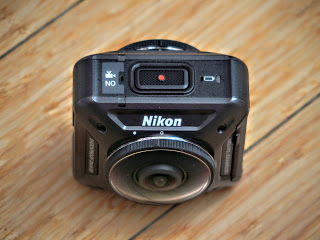 I want to get an action cam and the Nikon looks good, but the I am hesitant due to the software issues. Has Nikon released any meaningful improvements to the software in the months since your initial review? Hi Pete. To be honest, I don't use the app. I just use the Keymission by itself, so the software doesn't bother me. Nikon updated the app in December and it helped some people but didn't help others. You do have to change the settings in the camera one time (exposure compensation +0.7, active d-lighting: low) but you can do that by connecting the camera to the PC. You don't need to use the app for that. BTW there are 2 cameras being announced/released at the end of this month: the Next Gear 360, and the Kodak Orbit360. The Kodak Orbit360 will have an external housing which can be used for action. The Next Gear 360 might or might not have action capabilities. Could you confirm maximum video recording time while plugged in? I read it was limited to 1 hour despite NOT overheating, running out of space or battery.